with maximum safety for you and your staff. Please comply with all operation directions in this manual. 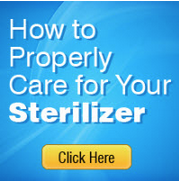 responsible for any misuse of the sterilizer or its parts. There is a small fee we charge to cover our shipping and handling. Most manuals are no longer available in its original state. So a copy will be sent.